Although it is habitually relegated to second place behind the apple (lower on the stairs, so to speak), there is a good case for arguing that 'a pear a day' will do you more good than its more famous cousin; (not that they are closely related, but they are both members of the plant family Rosaceae - yep, roses believe it or not). Here's what is so good about pears. Firstly they are hypoallergenic. Fewer people have an adverse reaction to pears than to just about any other fruit, which is why pear is commonly found in baby-foods and why it is often the first fruit that infants are exposed to. Pears are also high in dietary fibre (especially the skin) and one pear a day will provide all the fibre a person needs to maintain a healthy digestive system and to lower bad cholesterol levels. Next they are low in both calories and carbohydrates and low on the glycemic index, so are great for diabetics or anyone needing to keep their blood sugar levels low. In addition they are full of anti-oxidants like vitamin C and copper; also vitamin B complex, E and K all of which boost the immune system, boron which helps the body retain calcium and counter osteoporosis and phytonutrients like beta-carotene and lutein which have anti-inflammatory properties. Given all of those health benefits, it's not hard to understand why the miraculous pear came to symbolise immortality in ancient China. What is more difficult to account for is the marked ascendancy of the apple over the sumptuous pear. Is it simply because apples are hardier and longer-lasting, (not given to bruising and rotting so quickly)? Is it because pears are messier to eat? I suspect both to be major factors. In my opinion, however, there is nothing finer than a just-ripe pear sliced and accompanied by a little cheese. Mouth-watering (and healthy). Nowadays, like so much else, the vast majority of the world's pear production is centred on China - a quite staggering 80% (that's over 20 million tons of pears annually), with Argentina (at slightly under 1 million tons) a distant second. 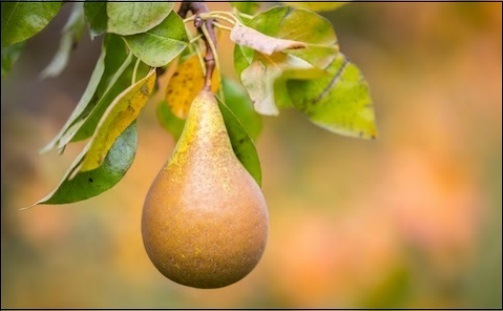 Of course, most of the pears consumed in Europe are grown within the EU (Italy, Netherlands, Spain, Belgium and France in descending order of tonnage - and the UK doesn't even feature on the list). Given the predominance of China as a pear producer and given the rapidly rising levels of pollution in that country as it heaves itself to the top of the world's table of industrialised nations, I began to speculate about what might happen to its vast orchards as the problem of climate change escalates - widespread air pollution, a ravaged bee population (with a nod to last week's blog), smog-filled skies through which the sun rarely penetrates and frequent dousing of acid rain - not a great environment for growing fruit! For summer has o'er-brimmed their clammy cells. Thee sitting careless on a granary floor. ripe with the juice of immortality. in every fast-declining perry grove. All good Steve - and love the Floyd bonus. Harbinger of doom (LOL). Seriously, another class blog my friend. Food for thought as you say, but hopefully that dark vision won't comer to pass. Good poetry from yourself and 'Keatsy'! What will be will be - but we're certainly making winning look difficult. Perry Groves - sounds like it should be a suburb of Birmingham... but what a great poem. Do you know what? I really enjoyed this. The blog was witty and informative, I liked both the poems (obviously knew the Keats from days gone by) and I haven't heard that Pink Floyd tune for at least 20 years. Grand blogging. Thank you. You could follow this up with Last Mango In Paradise (LOL).